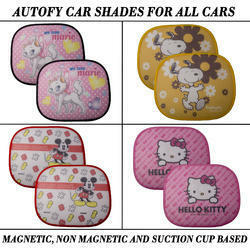 We are a leading Wholesale Trader of autofy sun shades for all cars from New Delhi, India. Comfort, Privacy and Style at a reasonable price is a rare combination that Autofy provides without failing. Same is the case with the latest offering from the trusted automotive brand. These Window Shades are a must have car accessory for a number of reasons. Indian summers have a lot of good things but a car parked in open on a sunny day cannot be one of those. It is in such scenarios that Autofy Universal Magnetic Mesh Fabric Window Shades / Car Curtains with Zipper for Maruti Suzuki Swift comes to your rescue. Once installed on the windows of your car, they block harmful UV rays of the sun and also keep the internal temperature in control. Another utility it serves is much-needed privacy while you travel in your car. Everyone peeking into your car is a thing of the past as the window shades do not let outsiders have a vision of the inside. They can even be easily installed, removed and re-installed without any hassle as being light weight all it takes to keep them stuck to the window is to align the sun shade along with the window of the car and the magnet itself gets stuck to the metal part of the car. Flexible frame facilitates easy folding making the sun shades easy to store and carry when not in use. In the pursuit of attainment of the light-weight product, quality has not been compromised. These car shades are also very easy and convenient to clean as they can be hand washed under running water with the help of a detergent. These shades are bound to last many summers to come. As we said earlier, a true combination of style and comfort at a reasonable price.